Why are taxes so much higher in Europe, consuming 46 percent of economic output compared to 32 percent of GDP in America? Is it because nations such as France, Greece, and Sweden have adopted the kind of class-warfare policies that Obama wants for the United States? As explained by Veronique de Rugy, the United States actually has a more “progressive” tax code than European nations. The corporate tax rate is higher in the United States than in any European country, and the double taxation of dividends and capital gains also is far above the European average. Western European nations tend to impose higher tax rates on personal income, so the overall tax burden on the “rich” is roughly comparable on both sides of the Atlantic. Since the United States and European nations impose somewhat similar tax burdens on upper-income taxpayers, what accounts for higher tax collections in Europe? Simply stated, the Europeans collect a lot more from the middle class. The value-added tax, which averages 21 percent in Europe, is a huge shadow income tax on lower-income and middle-income European taxpayers. 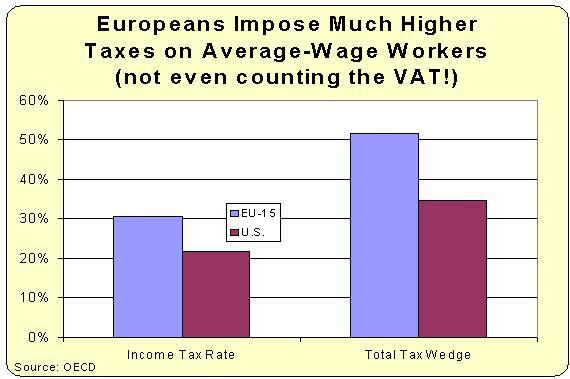 Europeans pay higher payroll tax burdens. Energy taxes in Europe are much higher than they are in the United States. European nations impose much higher income tax rates on middle-income taxpayers – as seen in the chart, which doesn’t even include the punishing impact of the value-added tax. The Europeans squeeze the middle class because that’s the only way to finance big government. That’s the point I made in this interview on Fox News. To elaborate, European politicians have learned that there’s a limit to the amount of revenue that can be obtained by taxing the rich. In part, this is because there aren’t enough rich people to finance a bloated public sector. But it’s also because Laffer Curve effects are very powerful at higher income levels. Simply stated, rich taxpayers usually have much more control over the timing, level, and composition of their income. It’s quite likely that European nations maxed out on the amount of revenue they can collect from the rich, which is why they started going after the middle class. People probably get tired of me warning against the value-added tax, but that’s going to the key fight at some point in the future. If the left (with the help of foolish Republicans) succeeds in imposing this hidden tax, I fear that the fight will be over and that America is doomed to become another Greece. After all, why would politicians reform entitlements if they have the option of slowly but surely pushing up the VAT rate? The middle class believes that befriending the monster that will eat up the rich will confer some benefit to the less well of, even after waste fraud and abuse. Alas, what they are creating will only have the rich (and their productivity) as an appetizer. The middle class will be the main course. Virtually all European people’s have sooner or later been bamboozled down this path of no return. It would take humans with different DNA to resist this shortcut to prosperity. Clearly not the case for Americans. To decrease government expenditure we need to decrease the size of government. We have to elect people that will do that!! In France, the “suffrage universel” is a “one head-one vote” system: The largest number wins, for the “President de la République” election, as well as for the “Députés”. Therefore, if one assumes that people who vote for the left candidate are the (financially) less favored, in other words the poorest, it is in the best interest of the left to have many poor, and to make the rich people go away. Yes, it will make France poorer, but it will lead the left to power. Grant Davies recommended your site from over at Left Coast Rebel. So here I be. I’m looking forward to digging in a bit and seeing what you have to say, Dan. Long Live the Republic, and to hell with democracy. Dan shows why we need to fight any VAT tooth and nail, unless the income tax is repealed altogether.